We are in GREAT NEED of color guard (flag) members for the marching band. The color guard provides color with flags/silks, drama with their movement/dance and intrigue with their drill and other equipment (such as rifles). We need 10-15 members on the field and we are several people short at this time. This activity is for males and females who are currently in 7th-11th grade. Please encourage people you know who are not currently involed in the band to come to a clinic. They would be joining a very successful organization and have a lot of fun!!!! No experience is required to join. We just need people who are interested in trying something new who will be dedicated to this growing, successful organization!!! I am writing to share some VERY exciting news! LES/LMS will continue to offer fifth grade band for the 2015-2016 school year as a daily class! We structured fifth grade band in a whole new way this year and it was a huge success!! Fifth grade band is set up as a class. All beginning band students (fifth and sixth grade) will have band class first period at LMS. Fifth grade students will ride the bus to LMS, get dropped off or walk. They will arrive with the rest of the LMS students. (Students should arrive between 7:10-7:25 AM.) The students will have band everyday as a full band. We will start band the first day of school! The fifth grade students will essentially be middle school students for one period. They will abide by the rules and expectations of LMS. Students will earn a grade of S, P, N or U. (*Please refer to the grading rubric below.) I will take attendance for the day during band class and that will be reported to LES. After band class is over, there will be a bus to take the students to LES for the rest of their classes. They will arrive in time to eat breakfast at LES and to be in class on time. The students will have a two-week window of time to change their mind about enrolling in band. After that they are obligated to follow through with their commitment for the rest of the school year. This is an expectation for all LMS students and we will be following LMS rules because they are enrolled in an LMS class. Students are strongly encouraged to take their instrument with them everyday so they can practice at home. They will keep their instruments in their homeroom at LES during the school day and will need to take it home with them each night to have it for class the next day. The students will be able to keep their instrument in a locked cage at LMS if they cannot take it home. (You will need to provide the lock.) At home practice is highly encouraged and is essential to progress and improvement in band! Students will be able to participate in band and the LES choir. Choir students will attend choir on Wednesdays and band the rest of the week. Students participating in both will not lose participation points for missing band to attend choir rehearsal. All current fourth and fifth grade students will attend an instrument demonstration on Friday, May 22nd. Our representative from Music and Arts/Colonial Music will be here to discuss and demonstrate all of the instrument choices. After this meeting please discuss with your child two or three options of what they would like to play. We will have two optional parent meetings to attend. One will be Wednesday, May 20th at 8:15 AM in the district office board room on the second floor of LES. The other will be held on Thursday, May 21st at 6:00 PM in the LHS auditorium. You can choose either of these meetings to attend but we ask that you come to one of the two if you have questions about signing your child up for band for the 2015-2016 school year. If you cannot attend either of these meetings and you have questions please email me. In the fall we will have a parent meeting on Wednesday, August 19th at 7:00 PM in the LHS auditorium. At this time our music representative will discuss the instrument choices for the students and he will briefly discuss the instrument rental/purchase program at Music and Arts/Colonial Music. It is very important that you DO NOT purchase an instrument before the beginning of the school year. If your child has an instrument before we begin band they may damage it, not learn proper technique and/or grow bored of this new adventure before we even begin. Please wait until our parent meeting to make any decisions or purchases. We will have instrument fittings on Thursday, August 20th from 3:30-7:00 PM and on Saturday, August 22nd from 9:00 AM-12:00 PM in the LHS auditorium. You will schedule a twenty-minute time block for one of these days at the parent meeting in August. The purpose of the instrument fitting is to let your child try their top two or three choices and be fit for the instrument they will be the most successful with. If you own an instrument, please bring it with you to the fittings to let the professionals check the condition and let you know if it needs repairs. We do not want any child starting on an instrument that does not work properly. I have a “Remind” text/email alert account to communicate effectively with you throughout the year. I set up an account for the beginning band for the 2015-2016 school year. To receive texts and/or emails from me about band for next year text @lms1516 to 81010. You are only able to receive messages from me on this system. If you have any questions please feel free to contact me. I am very excited about the opportunity to work with you and your child and to teach them the joy of playing an instrument. Please fill out, detach and return the information sheet at the end of the letter to your homeroom teacher no later than Friday, May 22nd. Participates and is prepared for class, musically and mentally everyday. Shows noticeable/above average improvement on playing and written assessments. Displays a positive attitude and willingness to listen and learn. Participates and is prepared for class musically and mentally everyday. Shows average improvement on playing and written assessments. Participates and is prepared for class musically and mentally most days. Attends all but one concert. Shows below average improvement on playing and written assessments. Brings their instrument to class 6 or less times a quarter. Rarely participates and is generally not prepared musically or mentally for class. Attends one or no concerts for the school year. Shows very little to no improvement on playing and written assessments. Displays a very poor attitude, does not pay attention in class, is unwilling to learn or make any consistent/positive progress. Shows very little effort. Please return this to your homeroom teacher or email to Mrs. Fugate no later than Friday, May 22nd. ________I would like for my child to be enrolled in 5th grade band for the 2015-2016 school year. _______ I do not wish to enroll my child in 5th grade band for the 2015-2016 school year. The Spring Concert will be at LHS on Wednesday, May 20th. All band members should report at 7:00 PM to warm up. When you arrive at LHS you will report to the band room. It is important that you are in the band room with your instrument out ready to warm up at the report time. We are sharing this concert with both high school choirs. They will perform first beginning at 7:00 PM. We will need to warm up quietly while they are performing on the stage. We will be giving band and choir awards at this concert and recognizing the Fine Arts Hall of Fame recipients. The concert attire is the red polo, black pants, shoes and socks. Ladies may choose to wear more “stylish” shoes if you wish. All students who plan to participate in marching band next year need to attend our spring rehearsals. All percussionist will have rehearsals on 4/29, 5/6 and 5/13 at LHS from 3:30­6:00 PM. The whole marching band will rehearse on Tuesday, May 19th from 3:00­5:00 and Thursday, May 21st from 3:00­5:00 PM. It is important for us to get together to play through the music and establish summer contacts with people in your section. I would also like to do some marching at these rehearsals so please come with the proper footwear and water! *Monday, May 4th­ Marching Band Parent meeting in LHS auditorium at 6:30 PM. Anyone planning to participate in marching band should attend this meeting! *Monday, May 25th –Memorial Day. Report to the Save­A­Lot parking lot at 9:15 AM. We will perform at the cemetery across the street at 10:00 AM and then immediately go to the courthouse. You will need your own transportation to the courthouse. You should not stop at McDonald’s or anywhere else between the two events. Eat breakfast before you come and bring plenty of water. We will wear our summer uniform red polos, pants and black marching shoes. You may wear sunglasses. *Thursday, May 28th –London Academy Graduation in LHS auditorium at 7:00 PM. Report time is 6:15 PM. Please wear your uniform. This is a tentative date and time as I have not confirmed this yet with the London Academy. *Sunday, May 31st­ London High School Graduation in LHS gymnasium at 2:00 PM. Report time is 1:00 PM. Please wear your red polo, black pants and dress shoes. We have accomplished so much this year including two trips to State!! I am so proud of everyone for their hard work and their commitment to making beautiful music. We will truly miss the senior class. Thank you for the many great years we had together. I hope you all continue to be makers, lovers and consumers of music for the rest of your life! When you arrive at LHS you will report to the band room. It is important that you are in the band room with your instrument out ready to warm up no later than the report time. This is not the time you should show up, or worse, leave the house. The concert starts at 7:00 PM. The order of the concert will be 6th grade choir, beginning band, 7th grade choir, Concert Band, 8th grade choir and chamber ensemble. It would be wonderful if you could stay around to hear other groups perform. The dress for the concert is the music department t-shirt, dark (black or dark gray) pants or skirts. Please wear dark socks and dark shoes. Ladies, you may wear sandals or other types of “dressy” shoes. All students who plan to participate in marching band next year need to attend our spring rehearsals. All percussionist will have rehearsals on 4/29, 5/6 and 5/13 at LHS from 3:30-6:00 PM. The whole marching band will rehearse on Tuesday, May 19th from 3:00-5:00 and Thursday, May 21st from 3:00-5:00 PM. It is important for us to get together to play through the music and establish summer contacts with people in your section. I would also like to do some marching at these rehearsals so please come with the proper footwear and water! Chamber Ensemble only!!! The chamber ensemble will be participating in the OMEA middle school large group contest. This is the first time I have ever taken a middle school group to OMEA contest. I am very excited about this ensemble and the opportunity for us to be adjudicated! The contest will be during the school day on either Thursday, May 14th or Friday, May 15th. The contest will be held at Capital University. The dress for the performance will be the LMS band t-shirts and black pants with black shoes and socks. Ladies may wear dressy sandals. Please wear your uniform to school the date of the contest as we will leave early in the school day and will not have time to change. You will need to either pack your lunch or bring around $10 to go out to eat. We will not be at school for lunch. *Monday, May 4th- Marching Band Parent meeting in LHS auditorium at 6:30 PM. Anyone planning to participate in marching band should attend this meeting! *Monday, May 25th –Memorial Day. If you were in marching band last year you may attend this event, however it is not mandatory for LMS students. Report to the Save-A-Lot parking lot at 9:15 AM. We will perform at the cemetery across the street at 10:00 AM and then immediately go to the courthouse. You will need your own transportation to the courthouse. You should not stop at McDonald’s or anywhere else between the two events. Eat breakfast before you come and bring plenty of water. We will wear our summer uniform red polos, pants and black marching shoes. You may wear sunglasses. This has been an outstanding year and I am excited to see how much we can learn next year!!!! If you haven't already you should sign up for text/email alerts by texting @londonband to 81010 for LHS updates and by texting @lmsbands to 81010 for LMS band updates. 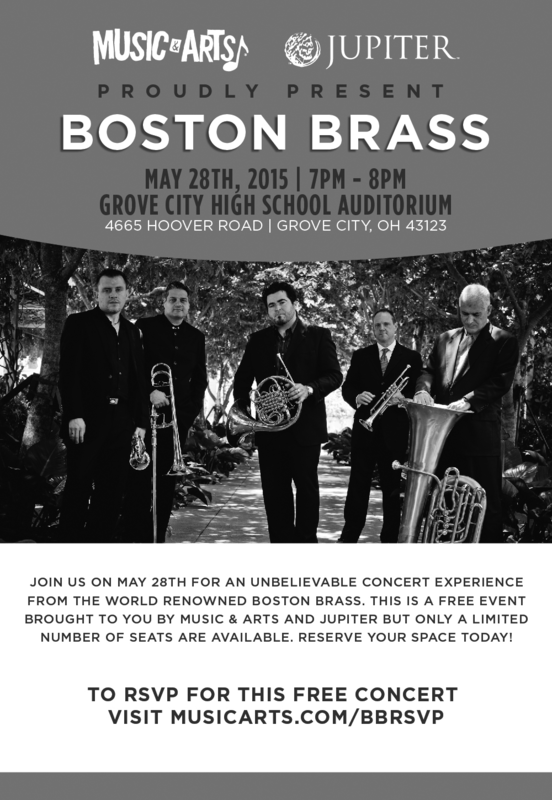 Music and Arts is hosting the BOSTON BRASS at Grove City High School on May 28th. This is a FREE concert but you must RSVP. There are only 700 seats available and we do want to fill the place. Attached is more information. This is a super educational event and we are proud to present this to central Ohio. Please check it out and hopefully attend. The London Marching Band is seeking individuals interested in serving as chaperones for Band Camp, to be held Sunday, July 26 thru Friday, July 31 at Urbana University. Please contact Mrs. Fugate if you are interested and/or you would like to find out more information. The front ensemble will be set as committment contracts are passed out and turned in in the next few weeks. Wed. April 29, Wed. May 6th, Wed. May 13 from 3:30-6:00 PM. 2:37-3:00 PM Change into uniform (black dress pants, polo, black shoes and socks. Ladies, sandals are ok but I would prefer socks or hose with anything that is not a sandal.) I encourage you to bring a snack to eat during this time and to bring money for concession at the event or pack a dinner. 3:05 PM Depart for Gahanna Lincoln H.S. 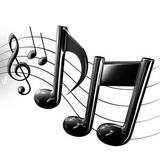 7:35 PM LHS Symphonic Choir performing at Gahanna Lincoln Middle School West in the auditorium. The google calendar has tentative dates/times listed for pre-camp and firm dates for camp at Urbana University (7/26-7/31). I have also listed the tentaive marching band shows we will attend this season. I will be applying for us to compete at the Ohio State Invitational again this year because it does not conflict with Homecoming!!! We will have to wait and see if we are accepted. I hope this will help you in vacation planning for the summer.